It’s a terrible dilemma, isn’t it? Breakfast? Or burgers? Breakfast? Or burgers? Well, who says it has to be one or the other? I say, have both. I’m all very in to combinations this week. On Sunday, a few friends and I had dinner at El Barzon in Detroit. If you’ve never been there, it’s a fine dining restaurant in off Michigan Ave that serves Mexican…and Italian. Mexican and Italian. Mexitalian. If that isn’t just a brilliant idea, I don’t know what is. Why choose between tacos or lasagna? Have both. This is America, damnit, the land of opportunity…to have both tortilla chips and salsa and gnocchi in the same meal. Apparently. Anyway, I was on my own for dinner yesterday and I decided to make something I’d been thinking about for a few days–burgers. 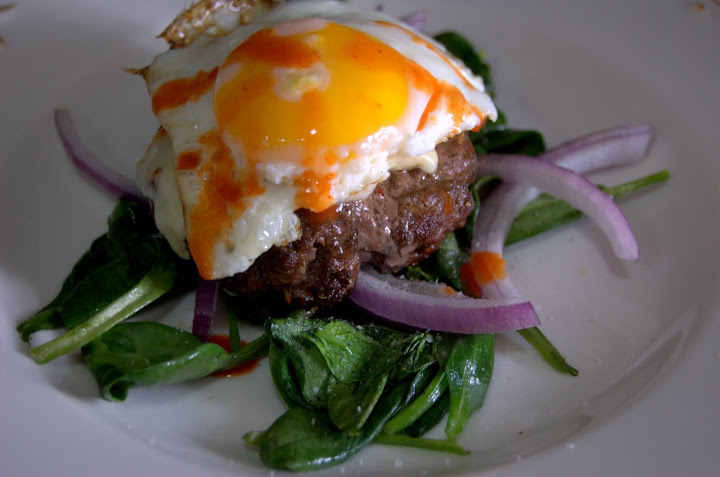 Specifically, bunless burgers with eggs on top. I don’t know why I’ve been craving that but the stomach is an odd and mysterious creature. I try to just give it what it wants, lest it rise up against me. I made this very simple, yet tasty meal to satisfy the hunger-beast. What’s really nice is that this meal is really easy to make for one person or four or whatever. Plus it’s a nice collection of flavors and textures—you’ve got the soft spinach at the bottom (or arugula would be good too), crisp red onion, the crunchy exterior of a well-seared burger flavored with spices and sage and then its soft, tender inside, gooey melted sharp cheddar, a pillowy, creamy egg on top and a drizzle of spicy hot sauce. I mean, be honest–you’re drooling right now just thinking about it. Making a mess all over your keyboard. Tsk. Place the ground sirloin in a bowl with the Turkish seasoning, sage and red pepper flake and, using a fork, mix together thoroughly. 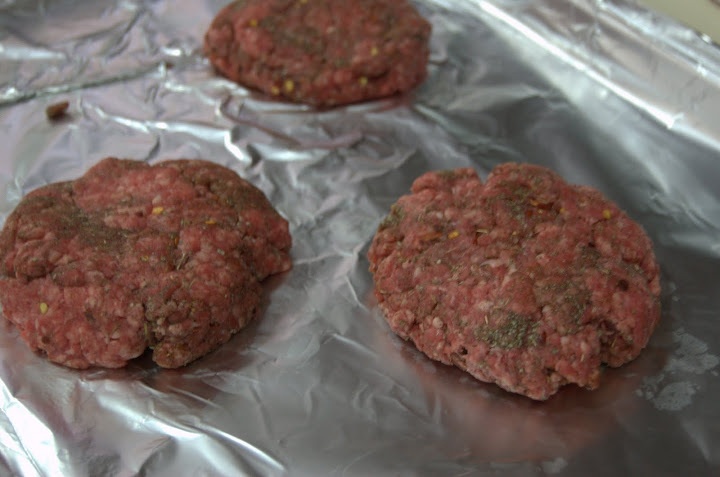 Divide meat up into thirds, a little over 5 ounces each, and roll each third into a ball. Flatten into hamburgers. Grill or broil burgers to your liking. I actually broiled mine, about 8 minutes on a side, since it’s winter here still. Add cheese to the top of each burger and melt down. Put butter in a large skillet and melt over medium heat. 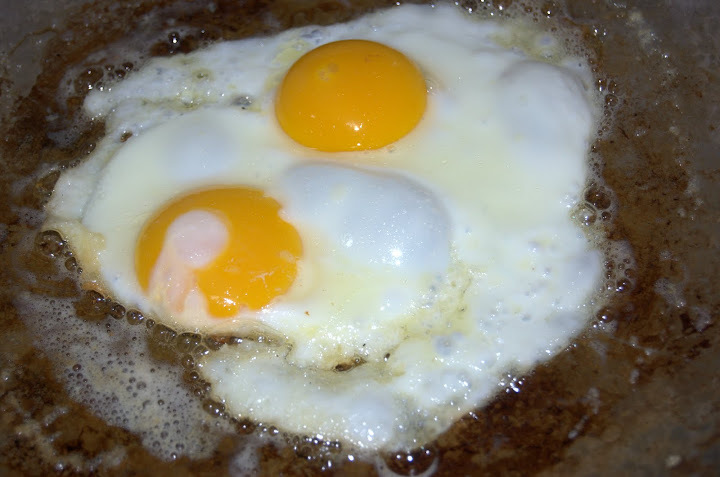 When the foam begins to subside, crack whole eggs into the pan and let gently fry. Sprinkle with salt and pepper to taste. You want the eggs to be about half done–somewhat firm to the touch but still a bit runny when you break into them. When they’re done, gently lift them out of the pan and set aside. Add spinach to the pan and saute for just a minute or so until slightly wilted. Plate: spinach on the bottom (sprinkled with a bit of salt and pepper if you like), then red onion, then a burger with cheese. Finally, gently place an egg on the top of each burger and sprinkle it with hot sauce to your liking. 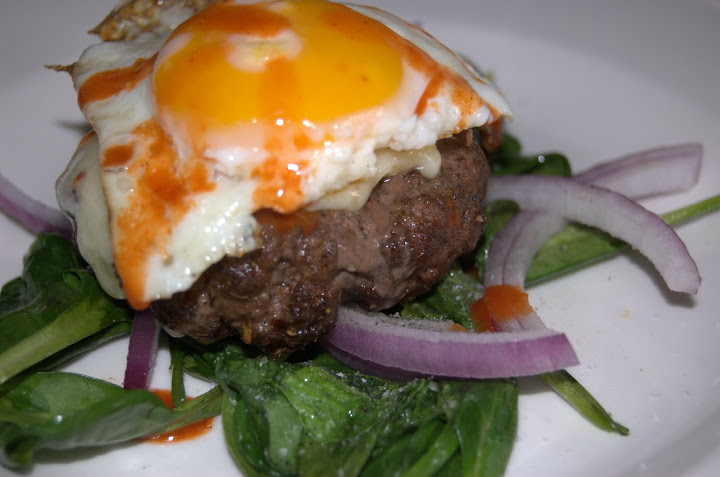 This entry was posted in General Musings, Recipes and tagged burger, egg, for one on March 1, 2011 by Lauren. I’m loving this, especially with that dash of hot sauce on the top! Looks like a good serving of healthy protein! Hey awesome, I’m making turkey burgers tonight – I will definitely do this! I bet this would be delicious with a turkey burger! I’m gonna try that too.